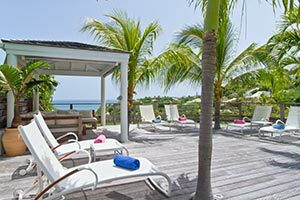 Villa UJV 200, also known as Villa Escapade, is the perfect three bedroom island villa with a magnificent view over the bay of Marigot, St Barts. Upon entering the villa, guests are treated with an open, well-designed living room that opens onto the terrace with pool (heated in winter) cantilevered over the blue of the sea. This exquisite contemporary villa is decorated in earth tones and is a harmonious blend of clean-cut lines, traditional colonial dark wood and modern design. Two bedrooms are located on opposite sides of the living room and each has king size beds facing the view. Large, modern, bright ensuite bathrooms complement these bedrooms. Outside the bedrooms is a covered sitting area with chaises lounges on the terrace. A third bedroom is on the lower level and has twin beds. Lush tropical gardens, with an allee of coconut palms leading up the driveway, are resplendent with rich pink bougainvillea. SPECIAL NOTE: This house rents for either the 2- or 3-bedroom price over Thanksgiving (the 1-bedroom rate is not available).